Picks to Click contributors for the 2014 season include: John Baetz (Kansas Pregame Magazine); Dion Clisso (PrepsKC.com); Matt Gilmore (Kpreps.com); Chet Kuplen (Kansas-Sports.com & @sportsinkansas); Conor Nicholl (Kpreps contributor); and Mark Schremmer (The Joplin Globe). Check back next Thursday to see our picks for week two, and how the players performed that we picked the week prior. See the bottom of this article for details. Barnes, perhaps the best running back in Kansas with five FBS offers, ran all over Coffeyville Field Kindley last season with 323 yards and five touchdowns. Bench press doesn't mean everything in football, but I can't remember the last time a high school kid carrying the football in Kansas benched 225 pounds 31 times, equaling a rep max of 434. Expect another big outing for Barnes in the 2014 opener. Bieberle is eight-man's top returning receiver after he caught 46 passes for 1,048 yards and 24 TDs and finished with 1,740 all-purpose yards and 10 interceptions on defense. Bieberle and Central Plains quarterback Braedan Crites (38/4 TD/INT ratio) will play host to Central Prairie foe Victoria in a high-profile contest on Friday. This year, Bieberle will likely receive even more passes in his direction after Central Plains graduated second-leading rusher Colton Zink. Bieberle had at least one receiving score in every contest in 2013 and had at least one catch for 20 yards in all but the season finale. A Kpreps 3A All-State selection last season, Horak enjoyed an exceptional sophomore season in leading the Bulldogs to a 12-1 record and a state semifinal appearance. Horak completed 59 percent of his passes for 1,706 yards and 14 touchdowns, while rushing for 1,807 yards and 33 scores. With as many as 15 other returning starters around him, look for Horak to lead the No. 2 Bulldogs to an opening win over Clay Center. 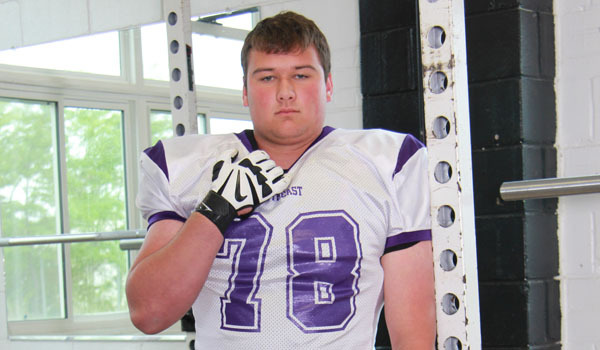 The Jaguars offensive line is led by Kansas State commit Evan Applegate. They open the season with a test against a revamped St. Thomas Aquinas led by new coach Randy Dreiling. Mill Valley's offensive line will be asked to open big holes for quarterback Logan Koch and a vaunted rushing attack that will try to play keep away from the Saints offense. A 6-foot-2, 247-pound senior for the Trojans, Murray's 86 tackles and 13 sacks were among the most by any d-lineman in Kansas last season, and a healthy Murray will look to kick the 2014 season off in style against rival Sacred Heart. Veteran coach Bruce Graber has done a solid job with the Sacred Heart program, continuing their winning tradition, but low numbers and little returning from an 8-2 squad will have the Knights with several question marks in week one. While Drew Gormley and Jerod Toogood provide two solid pieces on the offensive line for Sacred Heart, a fired up Murray - fueled by a home crowd playing host due to field renovations in Salina - should shine, as the Trojans look to avenge last year's 21-8 loss. The South Barber senior quarterback is a dual-threat for the Chieftains. Yandel passed for 1,147 yards and 17 touchdowns, while rushing for 1,620 yards and 32 touchdowns last season. He had six games where he passed for at least 100 yards and six games where he rushed for at least 100 yards. Yandel’s best outing last season came in a 60-34 win against Chetopa. He rushed for 393 yards and four touchdowns on 39 carries, while passing for 50 yards and a touchdown. Expect a big start to the season for Yandel and the Chieftains, who open their season Friday at home against Pratt-Skyline.